miniSIPServer can support customers’ own audio files to replace default files. With previous MSS, customers have to backup and restore these files once they want to upgrade MSS. This is a little trouble. With the new V32, we can resolve it now. When MSS starts up, it will create a sub directory ‘cust_ann’ in ‘mss_ann’ directory, now all your own audio files can be stored in this directory. When MSS is uninstalled or upgraded, this directory and its files will not be deleted or replaced by default files, and MSS can get audio files from this directory directly when it starts up. In windows system, it could be “d:/myvoipapp/minisipserver/mss_ann/cust_ann” directory by default. In Linux system, it could be “/opt/sipserver/mss_ann/cust_ann/”. Please refer to our online document for more details about how to record own audio files. 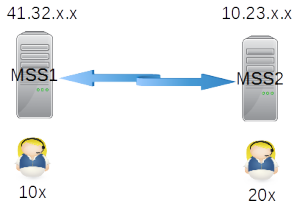 It deploys SBC or proxy to process all incoming SIP messages. Here we give a simplel example to describe how to work with Sonetel. We assume the SIP account is “abc@gmail.com”. In MSS, please cilck menu “data > external line” to add a record. 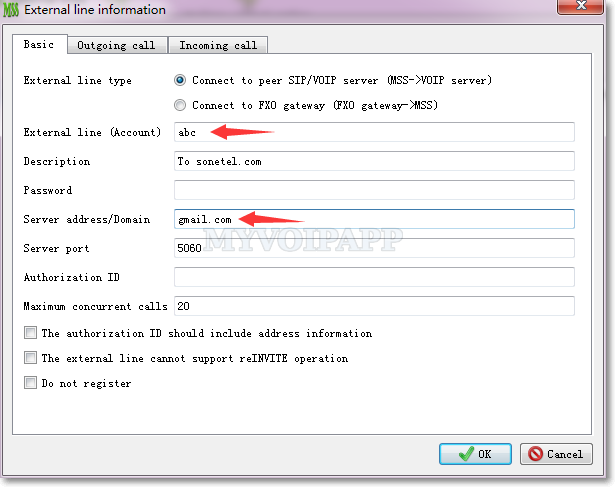 In “Basic” tab, the line type should be “Connect to peer VoIP server”, the Account should be “abc” and the Domain is “gmail.com”. By the way, the Password is the password you sign up in Sonetel, not your own email password. 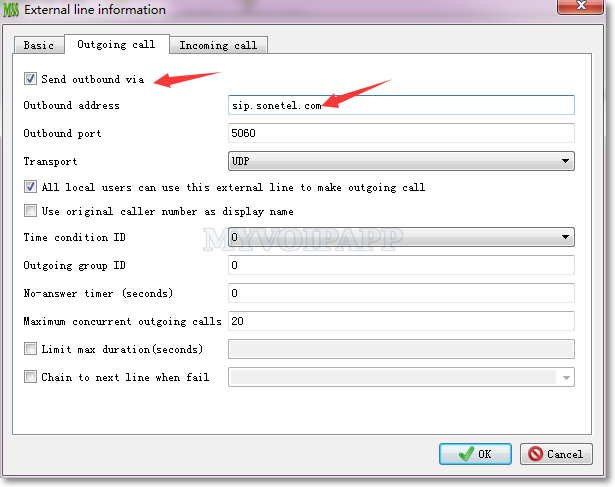 Since all SIP messages are processed by sonetel SBC/Proxy, we need configure “outbound” information in the “Outgoing call” tab. Please refer to following figure. The Sonetel proxy address is “sip.sonetel.com” which should be described in the email sent by sonetel. The latest Ubuntu 16.04 was released yesterday. Since it is a LTS version, we downloaded it as soon as possible and made some test in lab. Some libraries have been upgraded or changed in this version, we need update MSS to fit these modifications. 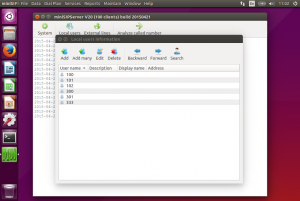 If you want to try miniSIPServer on Ubuntu 16.04, or you want to upgrade your previous Ubuntu to 16.04, you need install latest miniSIPServer V27 (build 20160422) . Please refer to attached figure, we run the latest MSS on Ubuntu 16.04. Main feature of this version is “customized DNS”. It enables miniSIPServer to query DNS result with own asynchronous interfaces and independent DNS servers. That means MSS will not be blocked if there are exceptions in DNS systems. Great! Debian 8 is released. 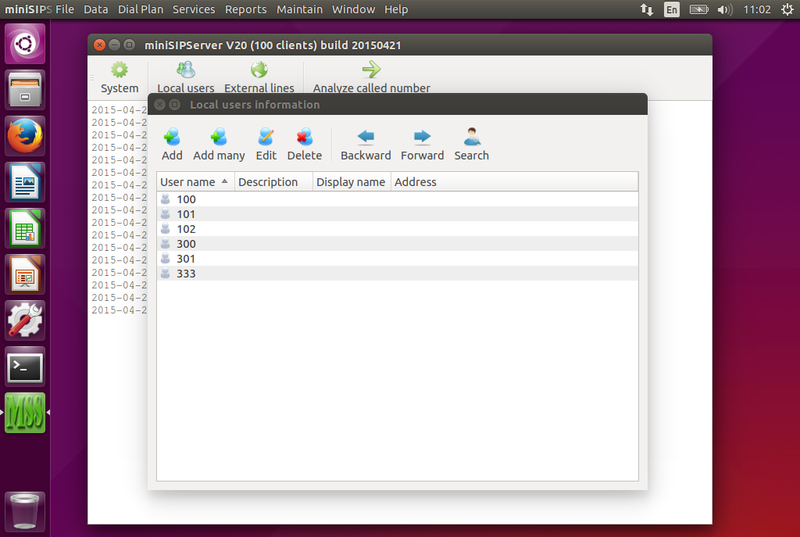 We install it in lab and make some test with miniSIPServer V20. Run miniSIPServer on Debian 8. It is glad to hear that Ubuntu 15.04 is released today. We download the latest 64bit version and install it in virtualbox to test our new miniSIPServer V20 version. 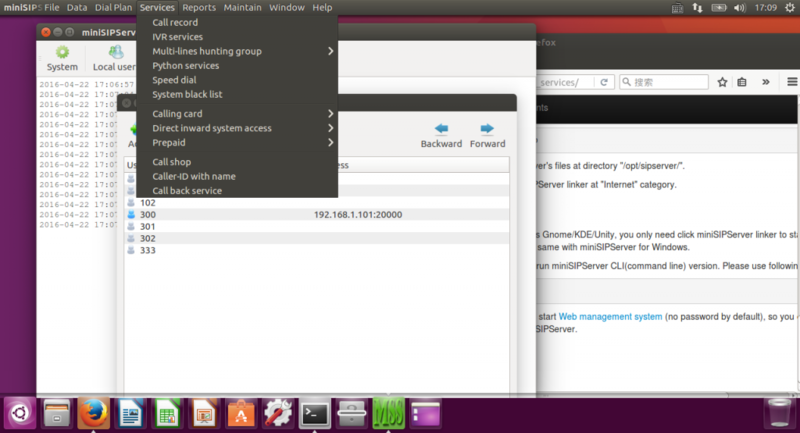 We are very glad that it is no problem to run miniSIPServer V20 on this Ubuntu version. So you can enjoy it yourself if you want to try latest Ubuntu 15.04. Of course, since 15.04 is not LTS version and is not recommanded to most customers, we suggest you to stay with LTS Ubuntu, such as 12.04 or 14.04.